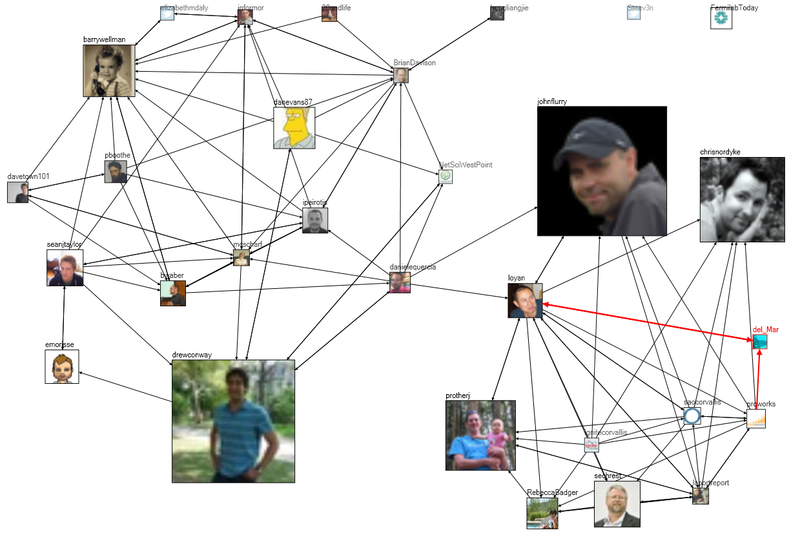 Twitter & flickr networks in NodeXL – Version 95: Lots of new features! Improved Performance! Version 95 of NodeXL is hot off the compiler and we are pleased to announce several major features that create a social media network analysis dashboard. 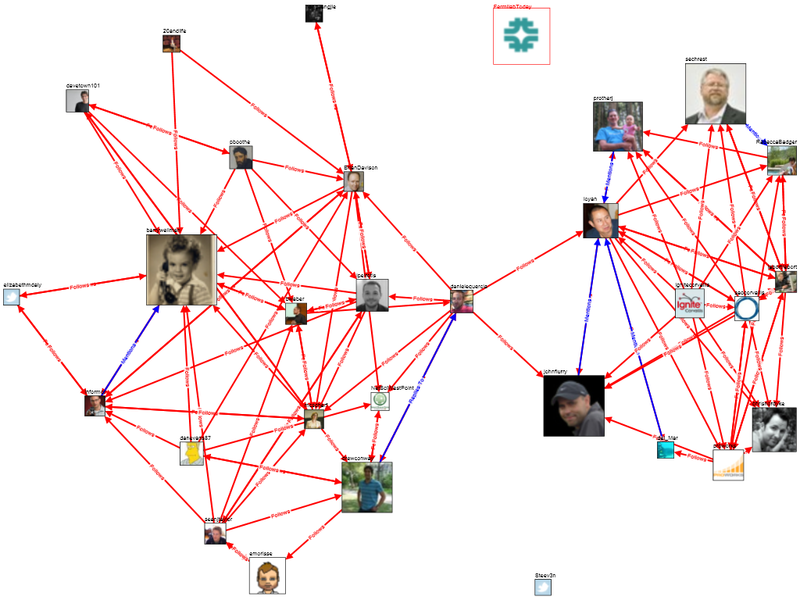 From the NodeXL interface it is now possible to import networks from twitter, flickr, email, and a range of social network file formats. Coming soon: support for more spigots – the connectors that pull data from leading social media sources. What social media data most interest you? We are considering integration with web and wiki crawlers, and support for YouTube, delicious, and enterprise data sources like Active Directory (LDAP), SharePoint, and Exchange. This release also improves support for images, particularly those pulled from URLS, like twitter or facebook profile photos! Here, for example, is a map of the connections among twitter accounts that tweeted the “WIN09” tag that was used in the recent Social Networks Summit at NYU (http://winworkshop.net/) The map illustrates the way the summit brought together previously separate clusters of people from the various disciplines that have been attracted to the study of networks in general and social networks in particular. Size of the image equals the number of tweets that person created. A refined version adds Edge Labels and color to highlight the different tie types in the graph: “follows” relationships and “replies to” and “mentions” and now scaled by “Followers”. In both views, the high betweenness role of one twitter account is clear. Release details below the fold…. Last week’s NodeXL meeting focused on the coming work items for the next release. Four major items are lined up for the next few weeks. We may publish a release once a few of these items are complete. > Legends and axes with scale marks for the chart canvass. 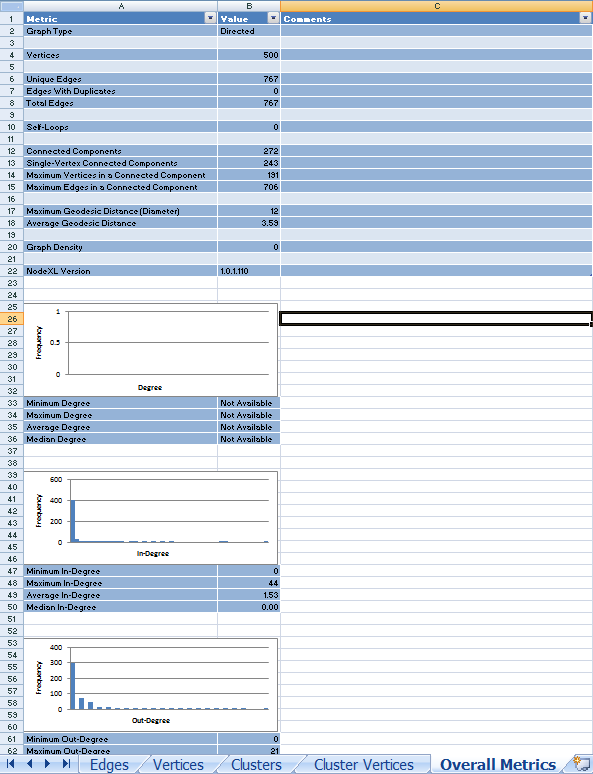 This is part of our larger work item called “Make the charts ready to publish”. A related work item to address this goal is export to a vector file format. A scalable vector format will allow people to create graphs of arbitrary resolutions to fit their presentation needs. 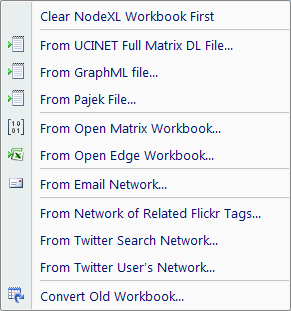 Since NodeXL is intended to support non-programmer network analysts we plan to add support for other network analysis file formats. A leading example is the UCINet format which has the added virtue of holding many sample data sets that are widely used in classes and network course work. If you have a network data file format you would like NodeXL to support feel free to comment here or on the Codeplex NodeXL discussion. Improvements to the layout of complex graphs is a deep area of research. A recent member of the NodeXL team, Janez Brank has proposed and prototyped an alternative mechanism for node layout, namely the Fast Multi-Scale Method from Harel and Koren. This method initially selects a small subset of nodes and lays them out; this initial layout is then refined in several iterations, with more and more nodes added to the layout in each iteration, until a layout of the entire graph is created. The cost function used to optimize the layout at each step is designed to reward layouts in which the Euclidean distance between nodes corresponds approximately to the length of the shortest path between them. Our developer, Tony Capone, plans to implement the design in the coming weeks. We have not added a new layout for a while and those recent additions have been deterministic geometric layouts like grid, circle, and sine wave. We have never added an alternative to the Fruchterman-Reingold force directed layout with which we started the project. This is a big feature addition that should have a big impact in making NodeXL layouts more visually appealing and informative. We hope these features deliver a lot of value to our users and address the big themes the team is working towards: Scale, Clarity, and Connection. 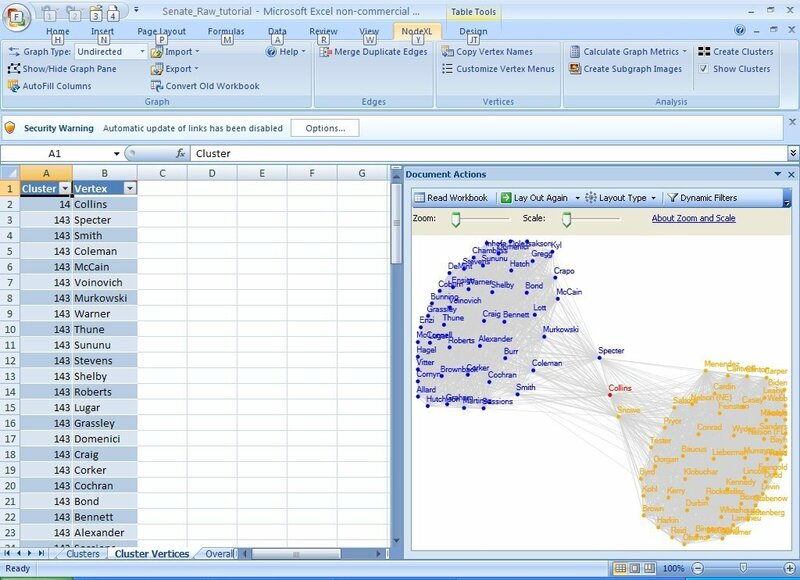 We seek to make NodeXL perform against reasonably sized data sets, to improve the exploration and discovery of structures in graphs, and to simplify the import and export of data between NodeXL and social media network data sources beyond the email and Twitter support present in the application today.